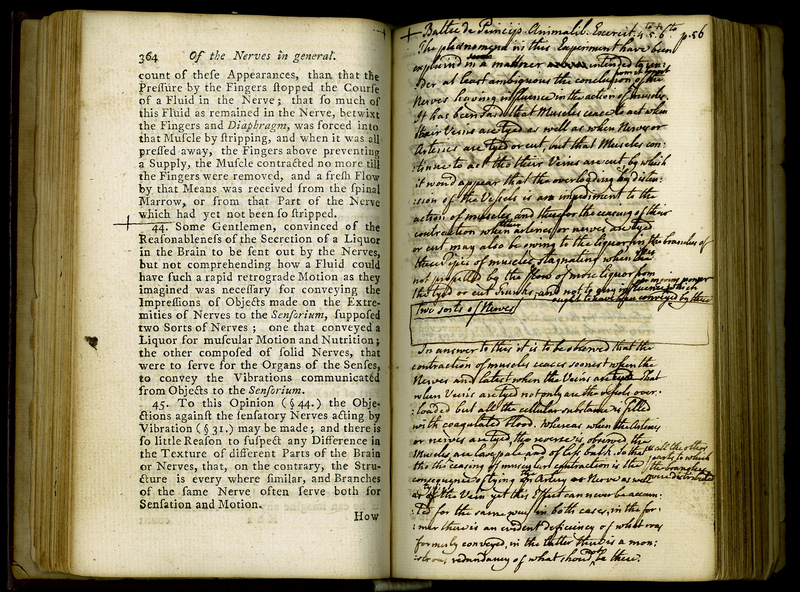 The Monro Collection consists of about 400 printed medical books and manuscripts owned in turn, and added to, by a father (primus 1697-1767), son (secundus 1733-1817), and grandson (tertius 1773-1859) – all of whom were called Alexander Monro. They were all medical doctors, and held the Chair of Anatomy at Edinburgh University. In 1929, the collection was transferred to the Otago Medical School, a gift facilitated by the grandson of Alexander Monro tertius, Dr Charles Monro Hector (d. 1935), a resident of New Zealand. This volume was written by Monro primus, and the published work has been interleaved so manuscript notes could be added by the author. Alexander Monro, “The Anatomy of the Human Nerves, with an Account of the Reciprocal Motions of the Heart, and a Description of the Human Lacteal Sac and Duct. 5th edition,” ourheritage.ac.nz | OUR Heritage, accessed April 22, 2019, http://otago.ourheritage.ac.nz/items/show/11215.